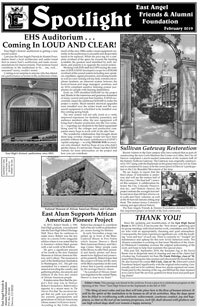 East High School – Supporting our historic building and grounds. Tower Museum – Preserving our past and supporting our alumni. Offering a Helping Hand – Providing programs for our students. Dedicated to Success – Preparing our students for the future. Following a comprehensive evaluation of our historic auditorium, EAFAF teamed up with EHS staff and DPS to tackle its greatest need – replacing a seriously outdated sound system. The updates are finally complete and we look forward to the next East production. Many thanks to everyone who donated to the much needed upgrades. EAFAF will continue our faculty grants program which covers a wide range of enrichment experiences for our students and will be making $55,000 available to teachers in 2018-19. For applications, please contact Erik Swanson at erik@swansonre.com or download the application. Our Student Assistance Fund and Angel Packs programs continue to provide fundamental support for hundreds of students and families – both of these programs also offer great volunteer opportunities for parents – feel free to contact us with your interest through the Volunteer button on this page. There are more terrific volunteer opportunities to be found there as well – we need you! The East Angel Friends &amp; Alumni Foundation is a registered 501(c)3. Tax ID is #32-0069773. This year's spotlight is here. View a list of current volunteer opportunities, or fill out our volunteer interest form and we'll find the perfect role for you! The East Angel Friends & Alumni Foundation is a registered 501(c)3. Tax ID is #32-0069773.